Do you dre­am of a sub­tle and warm inte­rior in your home? 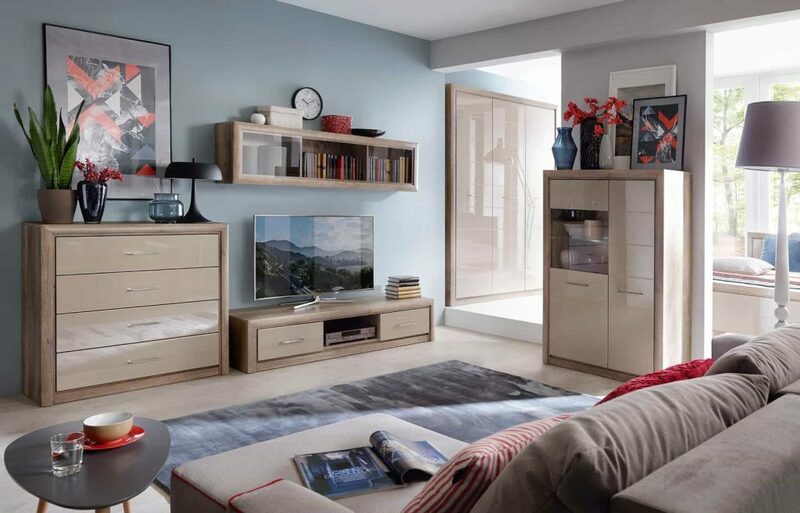 Put on sand beige and decors in a warm sha­de of wood and get acqu­ain­ted with the new col­lec­tion. Ele­gant spa­ce with deli­ca­te accents and appro­pria­te­ly selec­ted colors of fur­ni­tu­re and walls as well as a few exqu­isi­te addi­tions are an excel­lent reci­pe for such an atmo­sphe­re in the inte­rior. It is a pro­po­si­tion for lovers of modern and cozy inte­riors. The­se fur­ni­tu­re are not lac­king in ori­gi­na­li­ty, thanks to accents in the dark sha­de of gray in selec­ted modu­les. In the Koen II col­lec­tion the­re are many modu­les for the living room or bedro­om unit — dres­sers, TV cabi­nets, han­ging cabi­nets, cabi­nets, bed­si­de cabi­nets and a night­stand. The­se fur­ni­tu­re will also work in the dining room and hal­l­way.